Are you ready to try the BEST, yes I said it the BEST, side dish recipe? I have to limit making this to holiday time, or when guests are over because I could eat up the entire thing! Potatoes covered with cheese and melted butter, yep it’s so good! 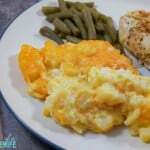 Cheesy Potato Casserole is a dish that always ends up on the table at Thanksgiving. Side dishes always seem to be the hardest to come up with. 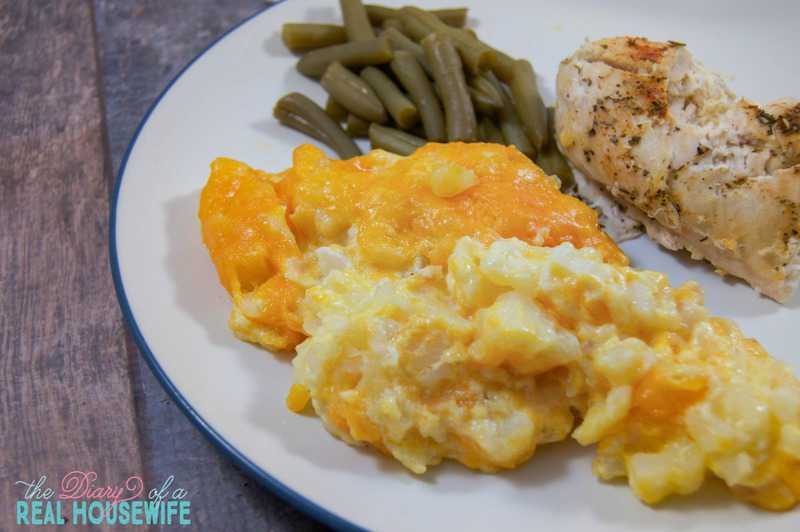 After you try this awesome cheesy potato casserole check out 101 more Side Dish Recipe Ideas. My mom has been making this cheesy potato casserole for as long as I can remember. We make it every Thanksgiving and Christmas. The entire family loves it! It’s my favorite side dish at both holidays, heck I could probably skip the turkey, and just eat a plate of this! You may think I’m overreacting with this, but I promise I’m not. Just try it for yourself! Growing up we always referred to this recipe as Cheesy Potato Casserole. 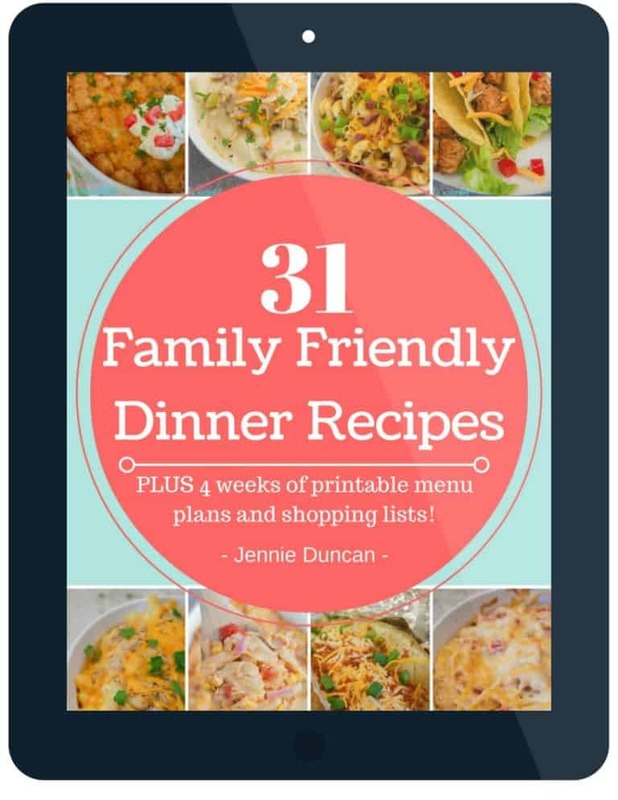 I’ve seen lots of other recipes, and they call it Crack Potatoes or Funeral Potatoes. This one is basically the same. The one big difference is we don’t top it with the cereal. My mom never liked it that way so instead, we added more cheese on top. Everyone knows more cheese is ALWAYS better in my book. Without fail, this Cheesy Potato Casserole will be on the table every Thanksgiving, every Christmas Eve, and every Christmas. We love it that much, and I hope you enjoy it just as much. Another reason I love this recipe is it is little work! Dump all your ingredients into a casserole dish and mix. Bake and you are done! Also, I have upgraded this recipe to become a full dinner option! 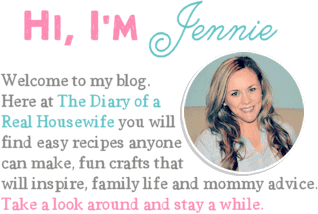 Try out my Cheesy Ham and Potato Casserole!!! Need a perfect side dish for your next holiday meal? 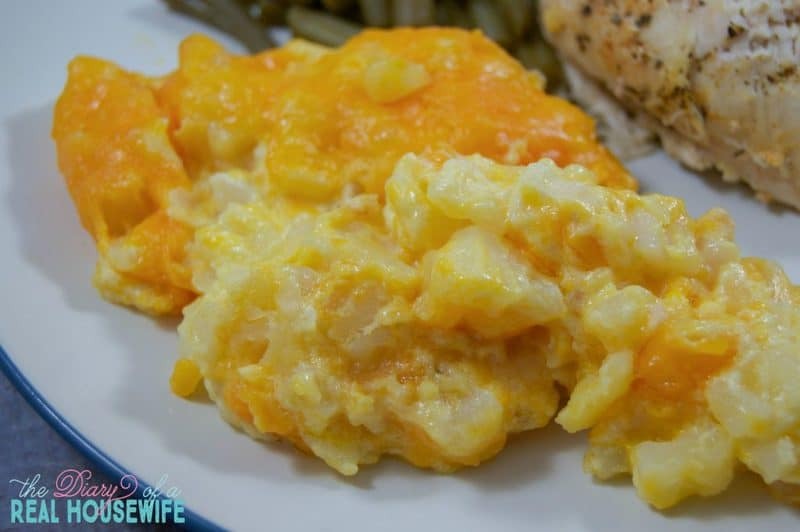 This Cheesy Potato Casserole will do the trick! In a large mixing bowl place frozen hash browns and minced onions and mix. Place your mixed ingridents into a 9X13 casserole dish and top with 1/2 cup remaining shredded cheese. I have made a similar recipe for holiday breakfasts or brunches- this is a great make ahead casserole. I am pinning so I remember for this Christmas! Is it possible to put this together and refrigerate the day before baking it? Yes! We do that all the time during the holidays. Mix it all up and then place foil on top and place it in the fridge. Check it after the time listed for baking because you may need to add more since it will be more chilled. One of my favorite side dishes!! Thanks Ellen! So glad you liked it! We made this tonight! It’s sooooo good!!!!! Hi Becky, this recipe has 7 servings. Hope you enjoy it, it’s my favorite! !